This variety of Sorbus is sometimes described as a plant collectors' tree - a slightly more unusual variety, similar to Sorbus Joseph Rock, but with pink/orange berries. The blue-green foliage provides very good autumn colour, transforming to shades of red, orange, copper and purple. The eventual height of Pink berried Mountain Ash is a modest 6 x 4m after 20 years so it is suitable for most gardens. The word "mountain" in its common name is a clue to the situations in which it is well suited - it's ideal for exposed, cold situations, but also grows well near water and in sunny, sheltered situations too - a brilliant all rounder! 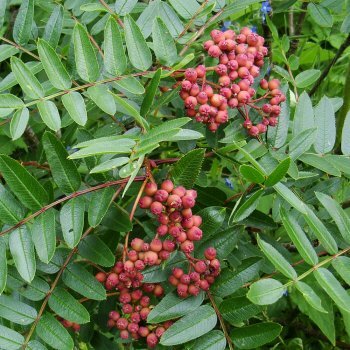 Our pot grown Pink Berried Mountain Ash trees can be planted at any time of the year. Start by removing weeds and grass within a metre of your desired planting hole. Dig a square hole as deep as your root mass and approximately 2x as wide. To help the tree establish more effectively, sprinkle root grow in the hole. We recommend planting Sorbus trees with a stake and tie kit. For single stakes, place the stake at an angle to avoid penetrating the rootmass and knock it in until it is firm. Use a buckle tie, placing the spacer between the stake and tree. Pink Berried Mountain Ash trees require a strong framework to support their beautiful pink/orange berries, so it is good to encourage this by raising the crown in summer. Simply prune the lower branches and any crossing, damaged or diseased branches within the crown. Hard pruning of Pink Berried Mountain Ash trees can be carried out in the dormant season, from autumn to winter.